Our Dirk Anger review pointed out that there have been three Nick Fury Marvel Legends, but no Darkhawk; that weekend, Hasbro announced this toy, expertly proving us wrong. Now do Sleepwalker. With incredible powers of both body and mind, these heroes prepare for any intergalactic mission. I'm not really sure how Darkhawk counts as a "master of the mind," unless we're talking about the fact that this isn't really teenager Chris Powell in the flesh - Powell found a magic amulet that he thought allowed him to turn into Darkhawk, but really the "suit" is really just an alien robot that he transfers his consciousness into. The android body and his body were just swapping places, and his mind was piloting the suit from a distance. The change was instantaneous, and the robot body could be repaired just as quickly, so it was basically like living in a videogame with respawn time set to zero. 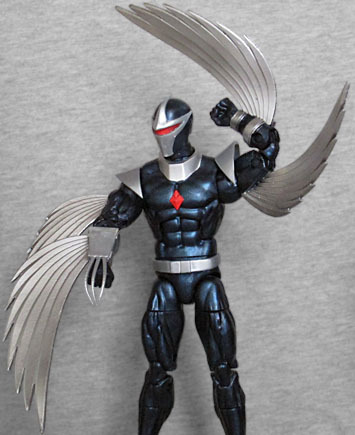 There was a Marvel Universe Darkhawk a few years ago, giving him his first-ever action figure, but whereas that one used a generic body with some clever new pieces to cheat the character's appearance, this one does one better. While it's still got the small Marvel Legends body's legs, but the torso and both arms are new molds to accommodate his costume elements. We applauded the way the 4" figure created the illusion of his amulet by molding it as part of his collar, but here it's actually embedded in his chest, exactly the way it should be. Ditto his shoulder armor, which are now separate pieces from the collar and have hinges of their own so they'll move out of the way. The grappling claw on his right hand still doesn't fire off, but it is soft PVC so it won't get in the way of movement (or poke anyone's eyes out). He's also got a new head, because other than trying to up-scale the 1:18 version, there was no other way to create his distinctive helmet. Like that release, this one is not as squared off as his original '90s design was, instead having a single seam down the center of his faceplate beneath the large red eyeslit. That sounds like we're describing a Transformer, and honestly, this head would totally work for one of them. There are other clues that this toy is based on the later incarnation of the character, such as having two bracers, rather than just one, or his amulet being solid red instead of black with a purple glow. His wings, which were originally purple with black tips, used to be retractable, but the modern suit seems to have them out all the time (and also they're silver). 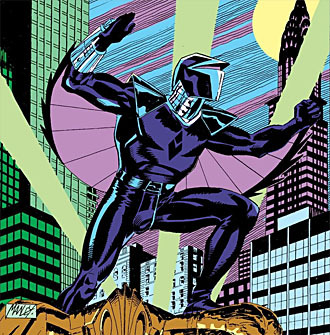 His body is a nice dark blue, though they could have gotten away with making it even darker - '90s coloring techniques had mostly progressed past the point of confusing blue and black on costumes, and Darkhawk really lived up to the first half of his name. Even when he was fighting Venom (yes, being [at first] a street-level hero, he inherited a couple of Spider-Man's villains), the two of them were nearly the same shade. This is better than the 4"er, though. Unlike that Marvel Universe figure, however, this one's wings are not removable. They're molded as part of the arms, meaning there's a big gap between the "feathers" on the triceps and those on the forearms. Is there really no better way to do this? It was disappointing years ago when Falcon and Vulture had wings like this, and it's disappointing now. I know Golden Pharaoh wasn't a perfect way to giving a figure wings, but it was at least an effort. This is just more of the same, when "the same" was already not that great. The rest of his articulation is good, though one of the shins was stuck on mine, and had to be boiled apart before it could work properly. 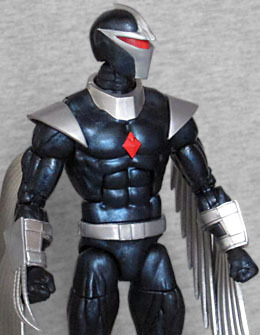 Darkhawk comes with the head of this series' BAF, Titus. 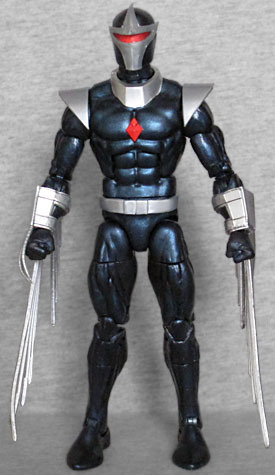 If you don't want to B the whole F, you can pretend Darkhawk decapitated a weird tiger. Hey, it could happen, the suit used to give him rage issues. It also had a face under its helmet that was hideously grotesque, but since it was never shown in the comics (things are scarier when left up to the imagination), it's not like they could have given this toy an alternate head or anything. 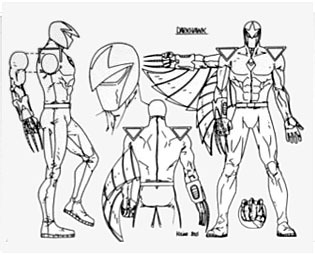 Unlike a lot of '90s comic characters, Darkhawk was created with a specific origin in mind: from day one, they knew where his armor came from and what its true powers were. So rather than fumbling about for an explanation as they went, Marvel was able to build a cohesive (if rather needlessly complex) arc that built toward the reveal. Plus, despite his totally radical '90s name, he wasn't an over-the-top badass antihero, but rather a nuanced Marvel character. ToyBiz tried to make a figure of him when they were doing Marvel Legends, but it's hard to imagine that that one would have been any better than this one, since this one is already pretty darn good. Shame about those wings, though.